This was more along the lines of "I've sent you a PM ages ago" than really asking if she'd read it. Good you posted, I hadn't noticed I had 2 messages waiting for me... sorry it took so long to reply. 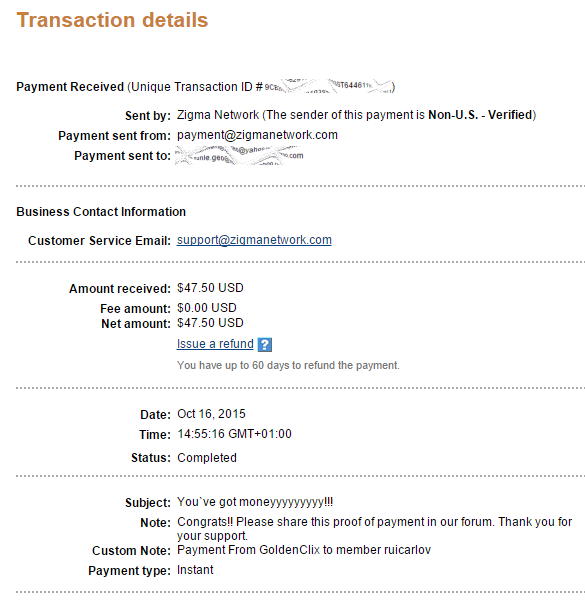 You have many active referrals at Goldenclicx or is it just simply a marvelous site ? You can have a notification e-mail sent to you each time someone sends you a pm. Yes I also use that too.. also this way you can keep a backup of your inbox in your email just in case it gets full and you would like to empty it or in case sth goes wrong with the site.. I'm running mostly on rented referrals (like usual:P). Thought at this point my direct referrals are starting to earn me around $1 daily. Definitely, I requested cashout twice, and didn't got anything, I canceled it, invested again in renting. then, 4 days agon asked for another cashout. get lost, not paying, even paid members. 2 months lost clicking it. I'm sure about what I'm saying. They recently enforced their policy of posting the previous payment proof before requesting another cashout, but other than that they're still paying. Well, I haven't received payments from them as I'm not promoting them nor working on any of them but I have purchased advertising a couple of times and now the email that I send the money to is the Zigma one.. 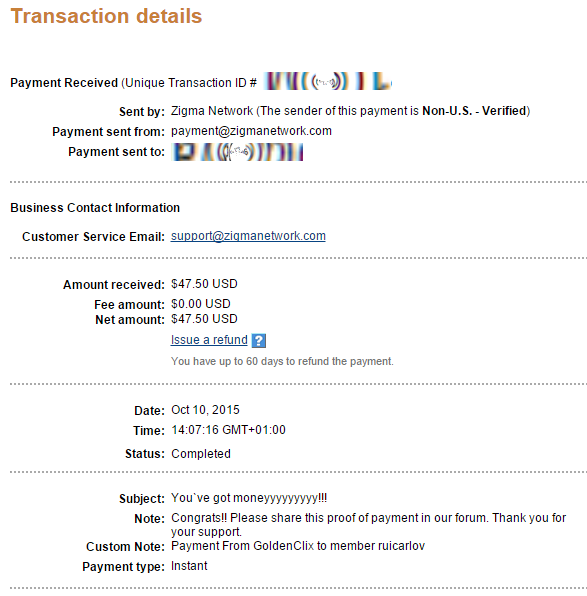 Yes, the paypal account they use now is for Zigma. 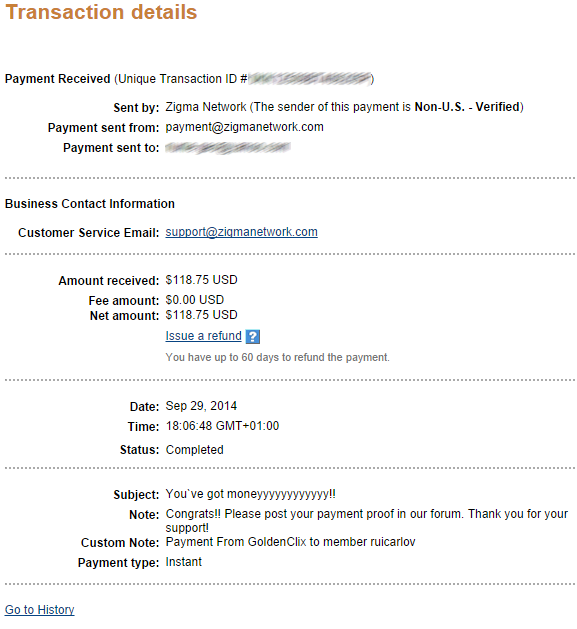 My mom (who's my referral) already made a cashout using Paypal recently and it came from Zigma. Wow.. your mother is your referral?!? That's impressive man! Too bad my own parents are way too old school to work on computers..
Well, when I first told her about PTCs and the large amount of money I invested there, she thought I was a fool, taking such a big risk in something so strange. Eventually, with the Portuguese government making succesive cuts on her retirement (+250€/month), she ended up asking me about 'those sites where you make money'. I ended up sugesting Goldenclix since she didn't want to invest too much and at the moment the site with quickest expected ROI was Goldenclix. Then the Paypal stuff happened and I thought "what did I get her into?". Things seem to be holding up and she's trying to get to ROI before growing her account any further or using that money in other sites such as Neobux (she's also my referral there, but only as a standard member). That's a reason why I kind of prefer to keep my whole online money making stuff to myself, apart from very few exceptions where people understand the risks included. I wouldn't want to feel guilty if I recommend anyone to a program that fails afterwards and I currently don't have anything really worth a recommendation, so I mostly keep this business as my dark little secret ..
Good luck on helping her out maybe with some of your earnings mate! We only get one mother, it's good to do the best we can for her.